At JKS Construction & Engineering, Inc., we are experts in the art of roof remodeling. Did you know that your roof takes up about 40% of the visible exterior of your home? That means the way your roof looks has a big impact on how your home looks overall. Or, it may be time to remodel your roof to maximize your home’s energy savings. If it’s time for a change, we can help. 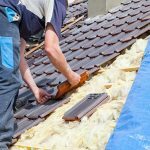 Felt underlayment has long been used in the roofing industry, however, synthetic alternatives have proven far superior. Polyurethane underlayment resists moisture and is stronger and longer lasting than felt. If you’re getting new shingles, you might want to think about upgrading your underlayment too. In the past, the only way to direct heat out of your home was to use white or light colored shingles. Now, shingles are available in any color you could want with a special reflective coating to help reduce heat buildup in your home — something that is particularly important in the summer months. Heavy duty roofing materials can also help protect your home in the event of storms, high winds, and other natural threats. When remodeling your roof, you should take into account both the look of the roof and its functionality. Architectural shingles are created by laminating two or more asphalt shingles together to create a three-dimensional look that is reminiscent of other types of attractive (and more expensive) roofing. Today’s architectural shingles can give a smart look and feel to a home while maintaining functionality and durability. Roof remodeling is a big job and it’s important to put it in the hands of experts you can trust. Contact JKS Construction & Engineering, Inc. now to get a quote for your remodeling project at 239-283-6054.